The MK232 precision power film radial leaded resistor series from Caddock offers a resistance range from 1Ω up to 5MΩ, a power rating of 0.75W and a voltage rating of 400V. 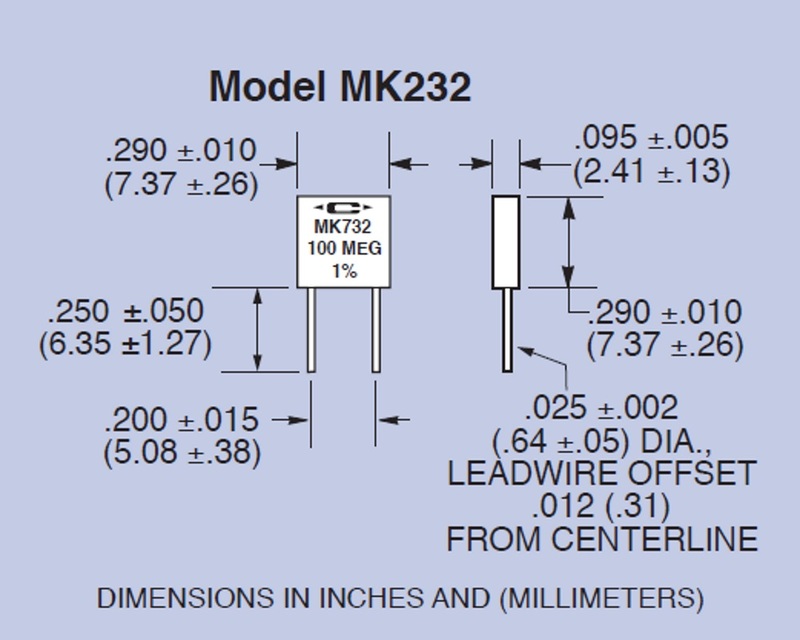 The MK232 series has a tolerance of ±1.0% as standard with options down to ±0.1% on resistances of 30Ω or higher, and also a TCR of ±50 ppm/°C for resistance values of 5Ω and above. 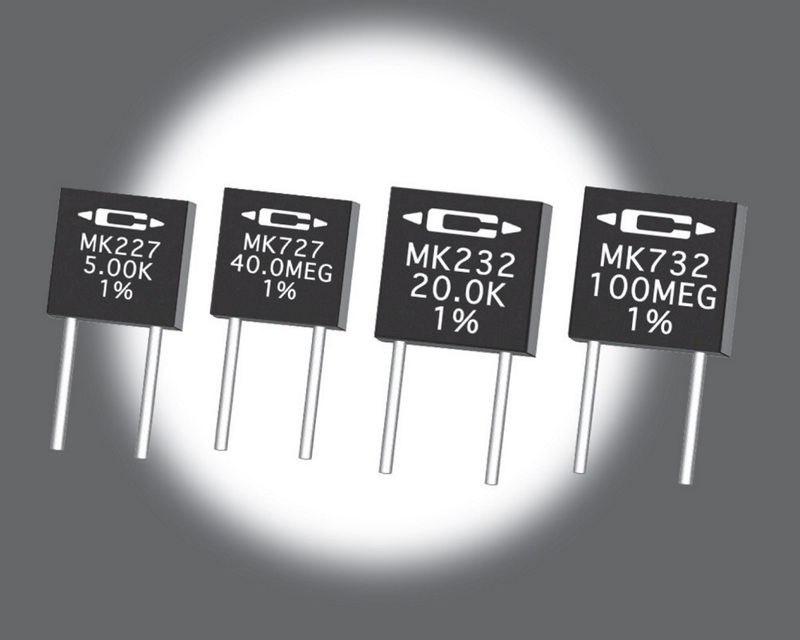 The MK resistor series is constructed with Caddock's Micronox® resistance films fired onto a solid ceramic substrate. The MK200 and MK700 series of resistors are the RoHS equivalent versions of the older non-RoHS MK100 and MK600 series. These resistors have pure matte Tin (Sn) lead finish optimised for use in commercial and industrial applications. With their compact design, it is easier to achieve greater packaging densities without the need for leaving extra space where resistor value changes can require larger resistors or non-uniform lead spacing. This product is available compliant to the RoHS EU directive 2011/65/EU, but, requires extra care during “Lead(Pb)-Free” wave soldering. The temperature of the resistor terminal adjacent to the resistor body must be maintained below 219°C during soldering. 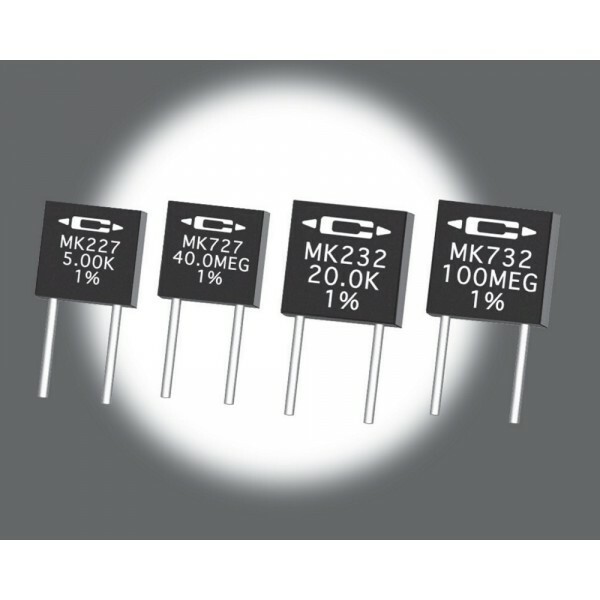 The MK227 precision power film radial leaded resistor series from Caddock offers a resistance range from 1Ω up to 2MΩ, a power rating of 0.5W and a voltage rating of 200V. The MK227 series has a tolerance of ±1.0% as standard with options down to ±0.1% on resistances of 30Ω or higher, and also a TCR of ±50 ppm/°C for resistance values of 5Ω and above. The MK resistor series is constructed with Caddock's Micronox® resistance films fired onto a s.. The MK727 precision power film radial leaded resistor series from Caddock offers a resistance range from 2.01MΩ up to 40MΩ and a voltage rating of 200V. The MK727 series has a tolerance of ±1.0% as standard, and also a TCR of ±80 ppm/°C (between -15°C and +105°C). The MK resistor series is constructed with Caddock's Micronox® resistance films fired onto a solid ceramic substrate.Compact rectangular power film radial leaded resistor with.. The MK732 precision power film radial leaded resistor series from Caddock offers a resistance range from 5.01MΩ up to 100MΩ and a voltage rating of 400V. The MK732 series has a tolerance of ±1.0% as standard, and also a TCR of ±80 ppm/°C (between -15°C and +105°C). The MK resistor series is constructed with Caddock's Micronox® resistance films fired onto a solid ceramic substrate.Compact rectangular power film radial leaded resistor wit..